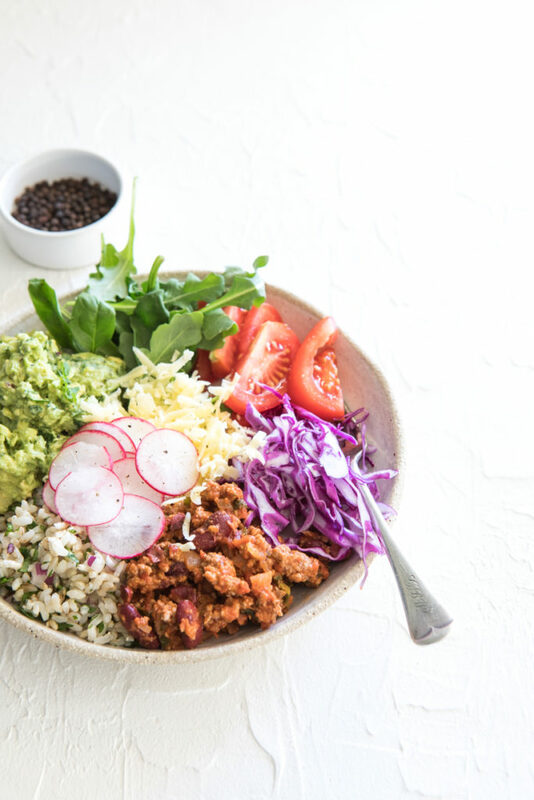 A Healthy Burrito Bowl because who doesn’t love burritos? I remember first trying this concept of a burrito sans the actual burrito (bread) several years ago in a not-really-Mexican-restaurant here in Sydney. Clearly they were going after the low-carb market and no doubt it worked (*sigh). But what bothered me, as often does when I’m dining out, is what I’d consider the wrong ratio of ingredients and general lack of flavour. Who made it that healthy dining = boring? 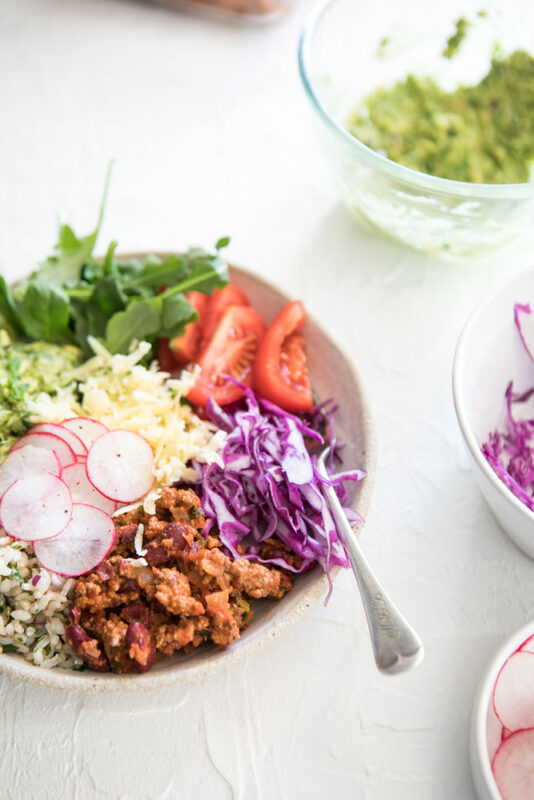 It’s safe to say that this Healthy Burrito Bowl is far from boring. And I love it for several reasons… It’s super easy to pull together. It’s versatile (we generally get 3-4 different meals out of the main bean mix). It’s packed full of the veggies that most of us miss out on in the day. You can freeze it. It’s delish. Need I go on….? This recipe serves four people though as I always suggest, even if you’re cooking for one or two, prepare the whole recipe and store the rest for later. COOK ONCE // EAT TWICE. This bean mix can be both refrigerated and frozen. 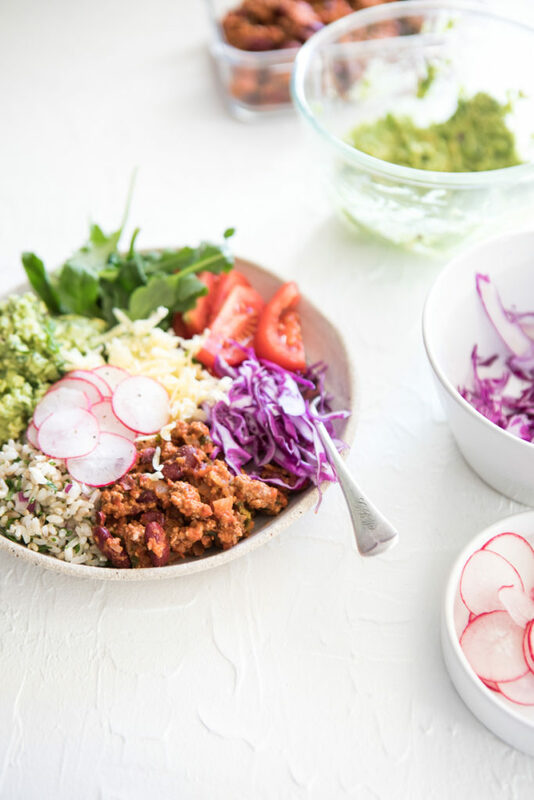 You can then either serve burrito bowls a few times in a week as the recipe calls for or mix it up to serve with whatever veggies you have on hand. 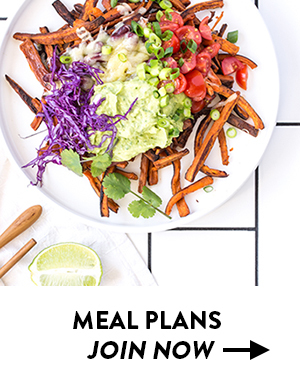 You can also use the bean mix to make a healthy nachos or to serve alongside any other veggies you have as the protein component of your meal. 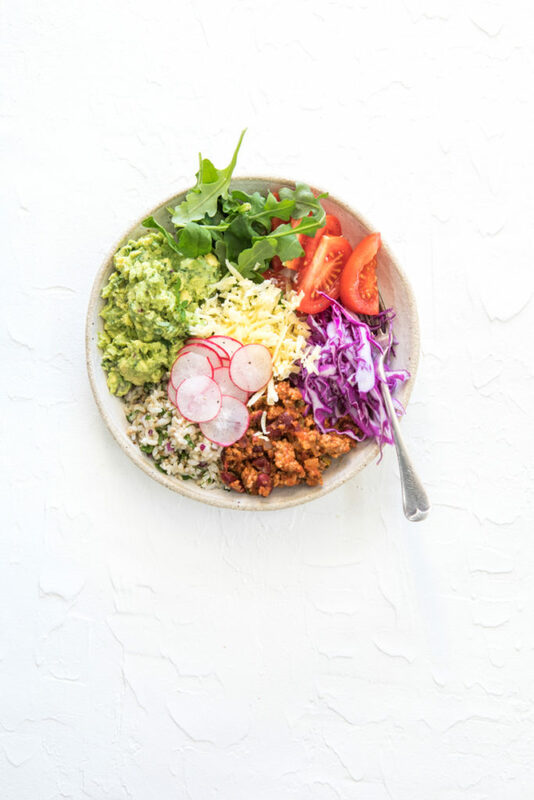 In our house, we make a large batch of brown rice most weeks as well so that this recipe comes together in a matter of minutes – just perfect for those long days. VEGETARIAN? Simply leave out the beef mince and add in another can of kidney beans. VEGAN? Follow the above + leave off the cheese. Even if you're only cooking for one or two people, make the bean mix from this recipe and refrigerate or freeze for another time. You can simply prepare the other elements to serve. See other serving ideas above the recipe.